Owner Trish Wattlington describes The Red Door Restaurant (741 West Washington St.) in Mission Hills as “farm-to-table.” It’s easy to see why. Most of the produce comes from Wattlington’s own farm. But what she and chef Kerrie Hills have accomplished at Red Door may be tougher than farm-to-table—they’ve established a wonderful neighborhood restaurant. San Diego’s restaurant scene has grown of late: a James Beard Award-nominated restaurant, brand-name chefs, openings garnering national attention and copious ethnic options. But “neighborhood restaurants”—family-run places we’d go to regularly for reliably good food at a decent price and not far from home—seem to have been left behind in the flurry of change. As chain restaurants consumed such places nationwide, today’s neighborhood restaurants went upscale in both food and price. Or, at least they did elsewhere. Here, until recently, they’ve just become nonexistent. Red Door is the kind of neighborhood spot that would thrive in any big city, with dependably good food, a bit of flair, a whiff of adventure and a lot of comfort at a price that won’t require a third mortgage. One of the best dishes at Red Door is a starter: grilled sweetbread with blue-cheese baklava and a fig gastrique. The sweetbreads (the un-offal) have a creamy texture and a flavor that’s mildly savory and vaguely sweet. They seem more like a cross between veal and pâté than a minerally internal organ. Chef Hill highlights the point by pairing them with two other components that straddle the savory/sweet line: the blue-cheese baklava and fig gastrique (think reduction sauce with more sweetness and acidity). It’s a dish that’s both comforting and exciting. 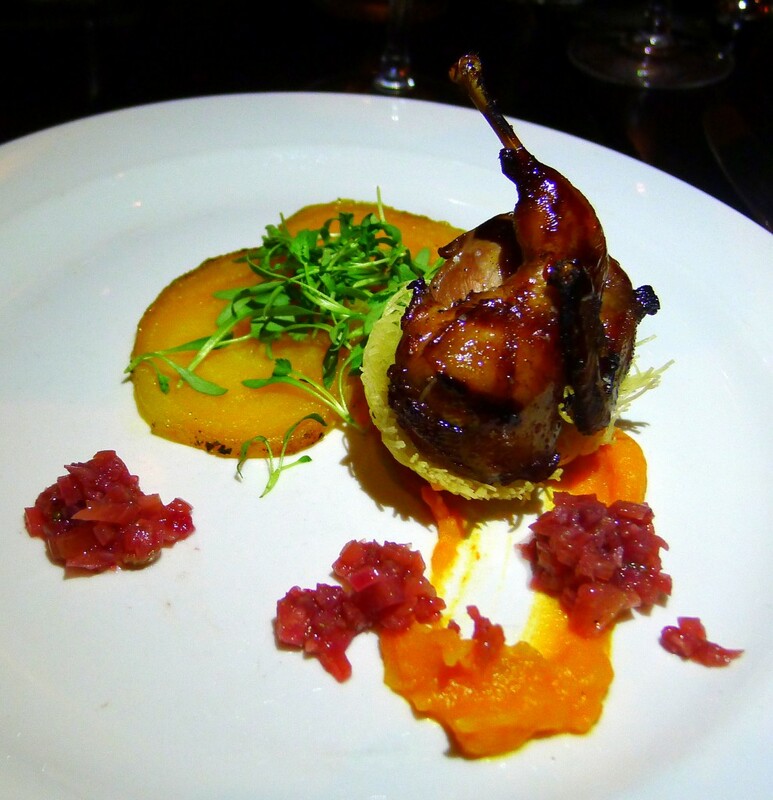 Chef Hills’ play at the intersection of savory and sweet is also successful in a grilled quail she pairs with butternut squash, beets, fennel and a Meyer lemon gremolata. It’s a conversation between the savory quail and sweet vegetables. On one visit, Chef Hills paired chai-smoked duck breast, a menu fixture, with walnut-mushroom dumplings, snap peas and ginger miso broth. The light heat from the ginger contrasted nicely with the duck’s richness and the sweet smoke of the chai. The dumplings, while tasty, were unfortunately a bit heavy in texture. The point of Red Door’s food is not to push culinary boundaries. The food shows thoughtfulness, but the point is to make you feel at home; to make you come back. That’s what a neighborhood restaurant is all about.